Oh and guys do you now what error happened to my PC and how can I fix it w/out formatting it again ? (I have lots of images and I can't afford to lose them again... ) I can't use it properly because of this error: Microsoft or Explorer Vbscript error or something like that... and when I open My documents (and my computer) some weird text appears so I cant see the images I collected ^^' and I'm using Opera right now... something happened with firefox... it wont open T_T so could you please help me? Hello Asta, How are you doing? you made a very nice wall, i like the bg, the brigdge and i like the painting effect.Only 1 thing: you made the falling leefs transparent.i think if you do that that it will look kinda fake.but for the rest you made a great wallie. keep up the good job, and im looking forward to your next submissions. well.. i wish you good luck with your exams. bye bye and have a nice day. Nice effects sis! Nice background and you made the characters pretty good here. But what happened on the content of your comment? Wow!! So nice background. I like all in this wall. Very nice wallie! I like the way that the colors are.... +favs for me! Aww, it's not crappy Asta, I think it's very pretty. ^_^ The characters match everything really well. :) Nice job! Wow :o Very very nicely done! I especially like that background! It's so pretty! Beautiful scan too :) Excellent job and a fav for sure! nice wallpaper, the two girls are very pretty and the background fits well to them, though i don't like the texture. And good luck with your exams. I hate to say it but those subjects are not my strong suite either when I was in school. Hope you'll prove it that you're better than me. Nice wallie asta! The girls there really suits on your background, they're cute XD Nice job! This is so cute... the characters are so sweet, and i love the effect you give to the bg... Nice wall, but maybe it remind us this season too early !! It's summer time, enjoy it ^_^' !! This is a beautiful wallpaper with such vibrant colors! I like it tons! It is sooo far from crappy! Great work! :D Crappy?! What are you talking about! You submitted a beautiful wallpaper!! T_T I am so glad to see such a nice one since lately I have been seeing so-so ones being submitted. 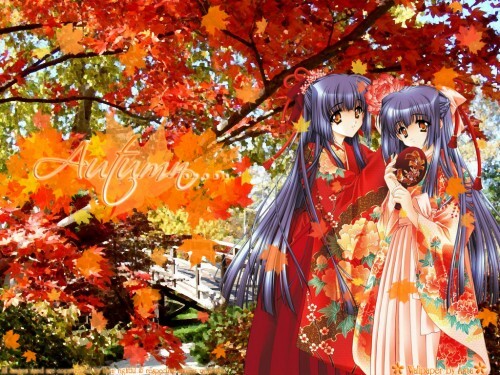 :) Autumn leaves is fine, sakura blossoms are always used so it is a nice change of pace. XD I really enjoy your usage of a pixelized technique in the bg. ;) It is different and better than just fading it out and off course it helps make the foreground images look even sharper. XP The layering of the leaves, blending, and coresponding colors are just wonderful. ^_^' I wish you lots and lots of luck for your exams and try not to burn yourself out and relax. :pacman: Great job, lots of luck and see you around MT again! hi asta my classmate!! watz up!! yeah what a nice work of your's again..
umm i hope i have talent too in drawing!! thanks for sharing your work to us..
i like the bg suuuper! !